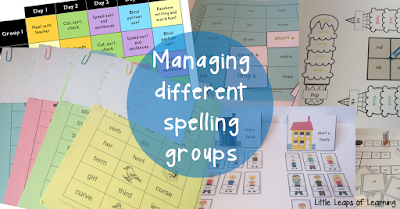 Today I'm going to share with you how I manage multiple spelling groups and word lists in my classroom. It is something that I have refined over the years and I finally feel like I'm running it in a way that suits me and my learners! My school uses Words Their Way, however the ideas I share in this post can absolutely be adapted to other spelling programs. I hope you find this post helpful and that you keep reading 'til the end, as I suggest some great resources that keep me and my class on track! After firstly doing some initial assessment, I look at grouping students based on their spelling developmental stages. Although it depends on each cohort, I try to have only 4 groups, although I have had more in the past. A handy tip to remember is if you have one or two students who are a whole lot behind or in front of your other groups, see if you can arrange for them to spend the spelling time in another class or year level. 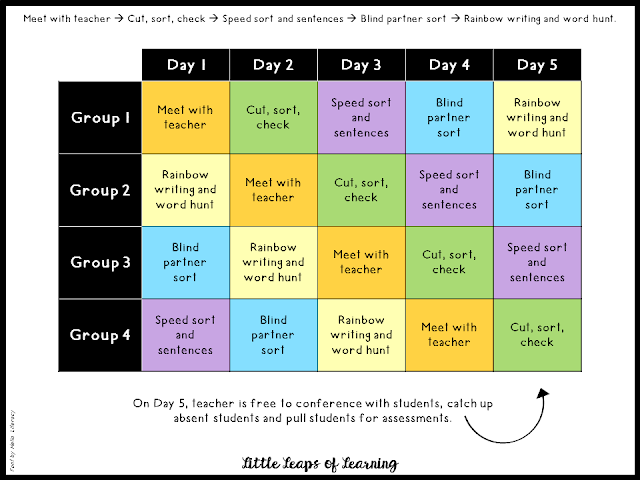 Usually teachers are doing spelling at a similar time during the day and it can work really well for a student to visit another classroom that has groups of students working at their instructional level. I keep the groups flexible. Don't feel you need to have students in the one group for an entire term/semester/year! I regularly have students moving across groups as they either quickly grasp, or need more time on, a spelling stage. This means you're always monitoring and checking in with each student. WtW uses assessment checks every 5 weeks, but keep reading to see how I incorporate student check-ins in my weekly schedule. Decide on how long you want each sort/word list to run for. I always run an extra day to the number of groups I have. Your class has 5 groups? Run a 6 day schedule (even if this means going over the weekend). Don't feel you need to do one sort/word list per week. Some years I have done the one sort over 6 school days - just because they needed longer with each set of words. However, with my last class I could group them in 4 groups so did a 5 day run. I find it helpful not to plan the schedule as Monday... Tuesday... Wednesday, etc. I think of it as Day 1, 2, 3, and so on. That way, if things go astray (which we all know can happen!) it won't throw your whole schedule out. Think of those times when you're unexpectedly absent, or changes to the timetable like Sports Day mean your spelling block is cut short. Planning it like this allows you to pick up where you left off! Sometimes my Day 1 could be on a Tuesday or Wednesday... and that's okay! Day 1 - the group meets with me while the other groups are doing their assigned activities. I have a word sort already cut out to model with (for some groups, I enlarge the words). I explain the week's spelling pattern and after demonstrating sorting the first few as an example, together we look at each word and sort and discuss them one at a time. Depending on the word list, I would ask focus questions like number of sounds, syllables, etc. This is a good time to clarify meaning of some words. With mini whiteboards, we practice writing words with that spelling pattern. This runs for about 15 minutes. At the end, I give each student a copy of their words for them to tuck into their spelling books for the next day. Day 2 - cut, sort, check. The students are working independently at their desks with the words they received the previous day, while I meet with a new group. 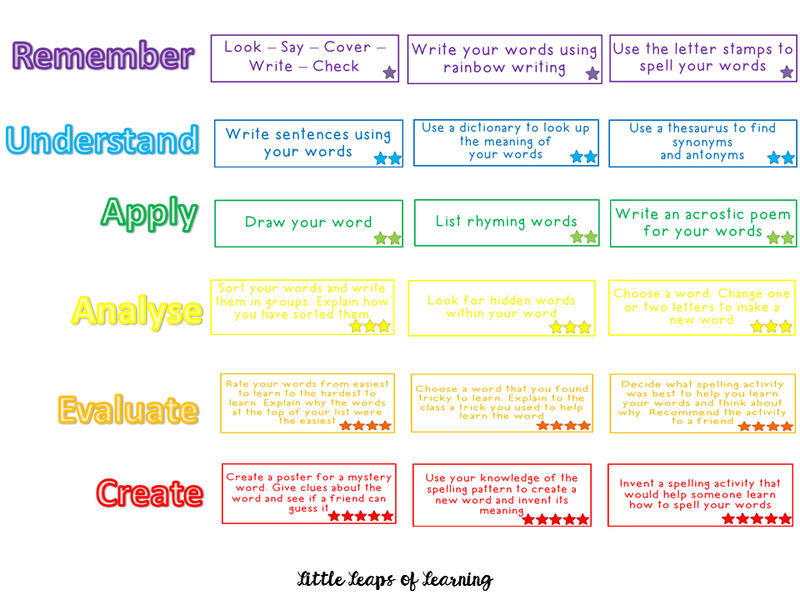 Students highlight/colour code the spelling pattern (e.g. highlighting the long a sound in rain, day). They also quickly scribble on the back in a coloured pencil, in a colour different to the others at their table (makes it easier to find the owner of lost words!). Students cut the words (explicitly taught - cut along the outside edge so there's only one piece of rubbish - then cut into strips, then put the strips on top of each other to snip all at once). They sort the words as we did together, and a partner checks that they have sorted it correctly. Depending on age group, this could also be when they write the week's spelling focus in their take-home books. Day 3 - speed sort and sentences. Each student grabs one of these sand timers from the tub and times them self quickly sorting their words (the timer is extra motivating for students! Ebay search 'mini sandglass timer'). Then, students write the word, draw and label it, and write it in a sentence that shows its meaning. The expectation is that they do 10 words for this. Day 4 - blind partner sort. In partners, students take turns saying aloud a word for their partner to write under the correct heading in their book. This requires a lot of modelling, and some years I replace this sort with another one if the class is not as independent. I don't bother having my students glue in their words - I don't think this is a good use of time. They actually throw their words out after I have checked their rainbow writing! I much prefer them writing out the words as a record in their book. A word hunt is when they search through books in our classroom library for other words that fit that spelling pattern to add to their list. Days 1-4 the teacher is meeting with groups. The beauty of having an extra day in the schedule means on Day 5, the teacher is free to check in with individual students, to catch up absent students and for assessment! Each day it runs for 15 minutes, with another 5 minutes for total transitioning/summary at the end. Get yourself organised, and then get your class organised! I prepare next week's words/resources on Day 4 or 5 - whatever day of the week that falls on. I know some teachers who photocopy an entire term's worth of words at once, but I could never do that as sometimes it changes, with a group possibly having to repeat a concept or skip ahead. I store one cut out version (sometimes enlarged) in envelopes paperclipped to the copies, ready to be handed out. The cut out version is the one I model with in the small groups. I always give the cut out copy to certain students who I don't want to have spending their spelling time cutting! Names of students in each group are written on the envelope, ready for me to call out (written in pencil - as it can change!). Students have their own spelling scrapbook and a ziplock bag or A5 plastic document wallet stapled to the inside cover. It's so important to set up the routines and expectations with the class so I can teach each small group without interruption. The first few weeks of the year (and again at the beginning of each term) the whole class does the same sort/word list. That way, we can learn and practice what each day of the schedule looks like, feels like, sounds like. For example, students need to be reminded of what a blind partner sort actually looks like, and how to independently troubleshoot problems. I have found that having meaningful, engaging spelling fast finishers is a necessity to a smooth running spelling block. Students finish their sort for the day at different times, so I always train my students on how to use the remaining time effectively (I have a timer on the board counting down 15 minutes, so they know how much longer is left before we pack up). 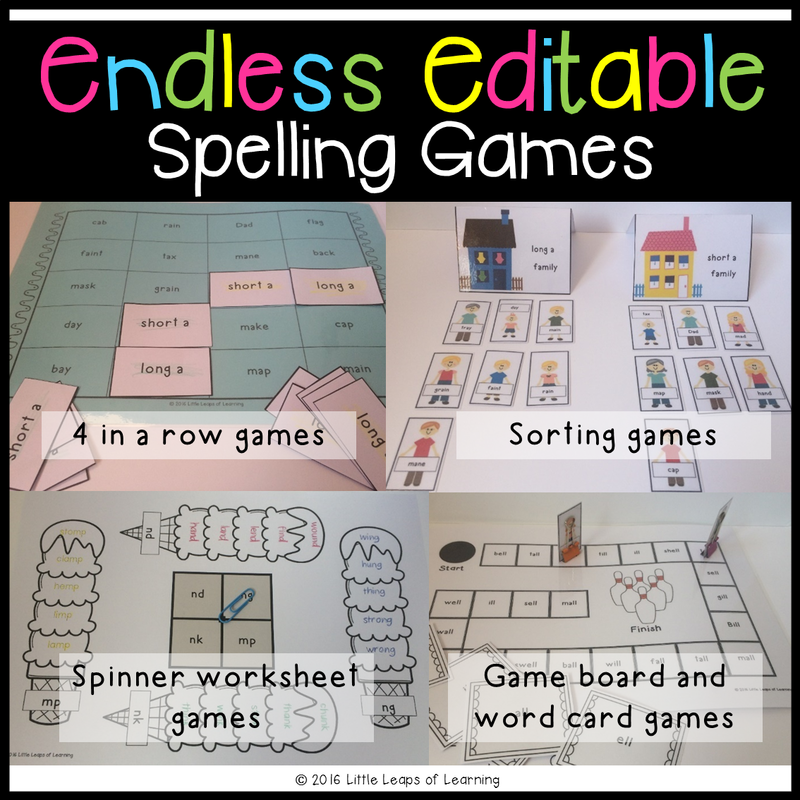 The best way to do this is with spelling games that are targeted at their level, as well as a spelling choice board. I store the spelling games in magazine holders like the ones below. Each magazine holder has the names of students in each group (written in whiteboard marker on a laminated card so that I can change as needed). 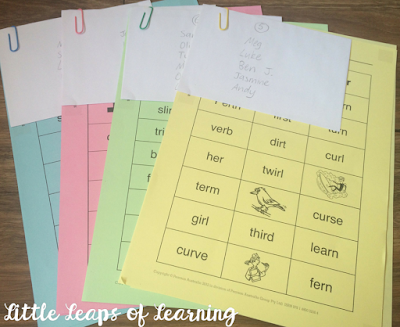 This way, students are choosing and playing spelling games that are at their level! There's no real point of a student who is learning greek/latin word roots to play games for practicing initial sounds! 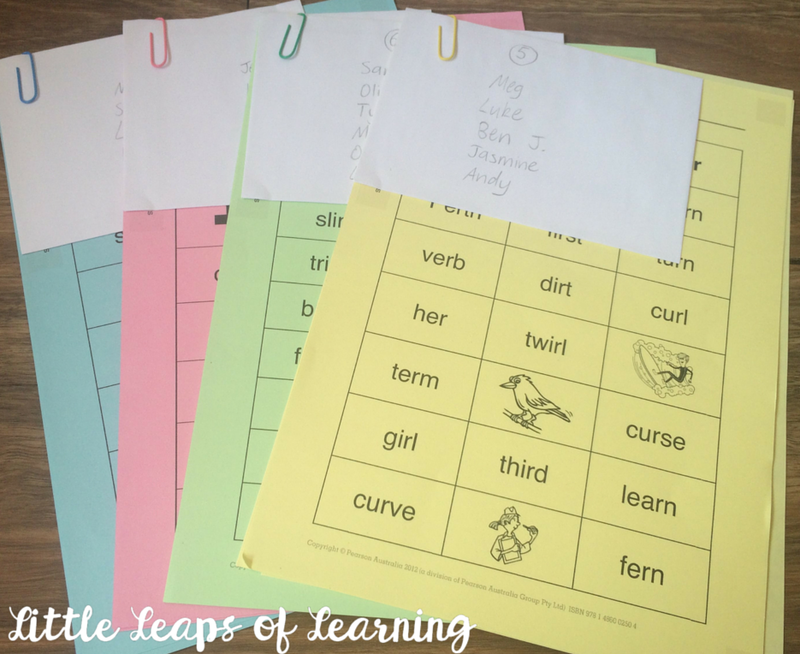 In each box I have spelling games from the previous weeks, so that this acts as a spiral review of all spelling words, rather than just the current week's words. Where do I get all of my spelling games from? 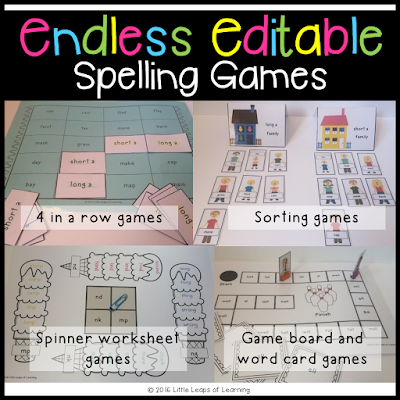 I use my Endless Editable Spelling Games. It's the cleverest resource and my biggest time saver. It uses a neat trick to duplicate form fields (see those blue boxes?) 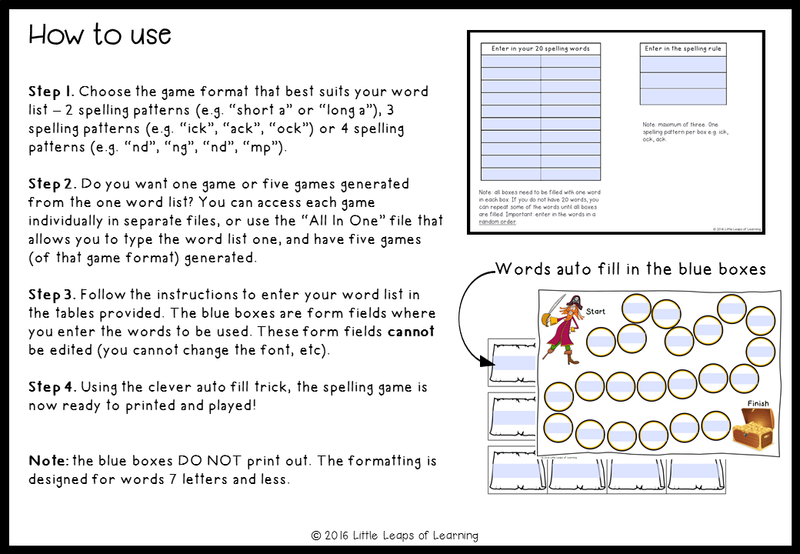 in a PDF which means multiple games are auto filled and generated from the one word list you type in the tables! 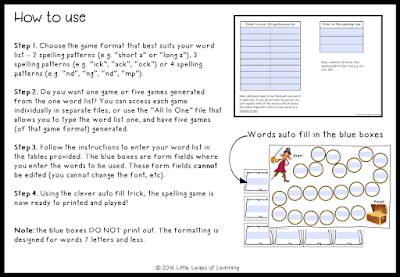 It's perfect for my spelling fast finishers, as I can type in the exact words from the word list I want the students to play with. I love it because I only have to type in the 4 x word lists, and it spits out all these games that are simple print, cut and play. 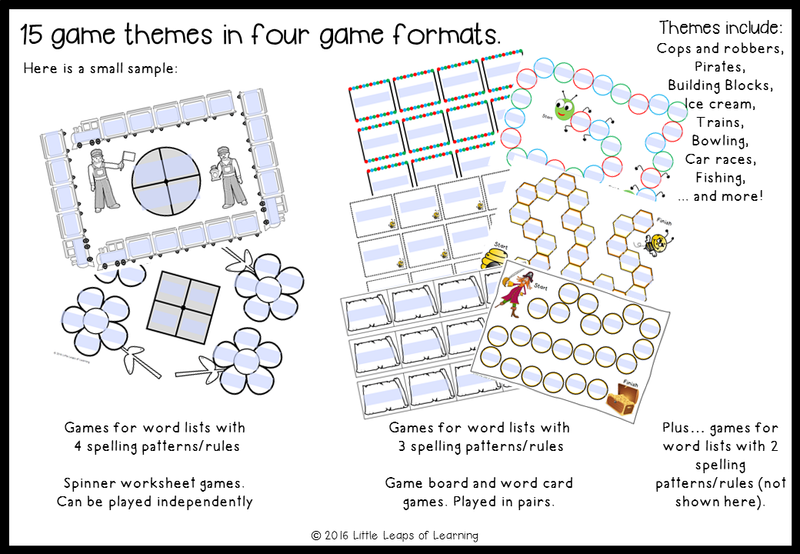 I print these games at the same time I photocopy next week's spelling words. Then, I pop them in plastic document wallets and they are good to go! 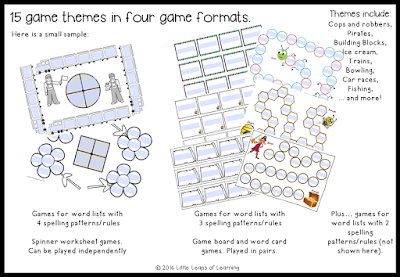 There are four game formats and once you teach your class the four ways to play, they will be able to play independently the entire year, for any word list! Of course, we don't just want our students memorising the spelling of words. We want our students engaging with words on a higher level. 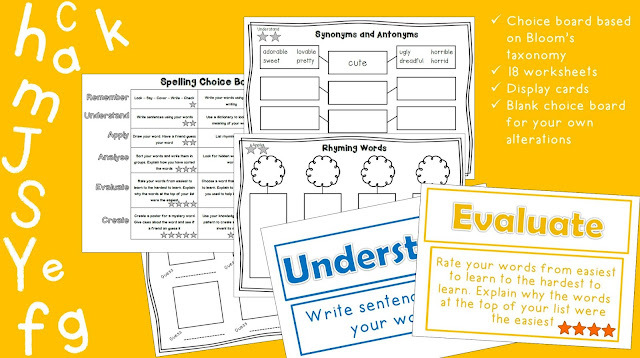 I use this Spelling Choice Board to encourage spelling with higher order thinking. I print off the higher order thinking cards and arrange them in an array like the diagram below (I'm sorry I haven't got a photo of this!). As I'm low on display space, I have them glued on large poster board so I can move it around. 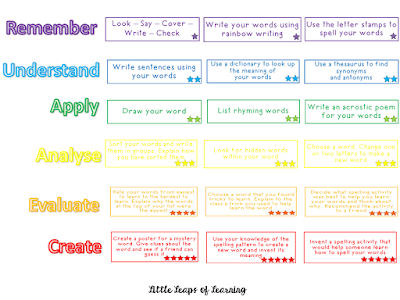 Students can choose to complete one of these tasks at the back of their spelling scrapbook. Lower thinking skills (look, say, cover, write check) earns them 1 star stamp, however I find most students are motivated to attempt some of the higher tasks to earn more stamps. I do a quick check of the back of their spelling scrapbooks every now and again to reward stamps, and check students are attempting higher order tasks. I store the accompanying worksheets in a magazine holder nearby. You can find the Spelling Choice Board HERE. I hope you have found this post useful. Please make sure you have subscribed by email, or are following my Facebook page below, so that you stay updated! 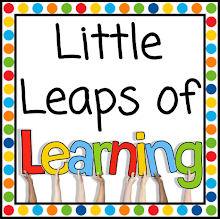 My next post will be literacy rotations. Hi Shelley, the group would be using the previous week's words from Days 1 -3. Day 4 they meet with the teacher to get NEW words to start the schedule again. I hope that makes sense! Thank you Lisa. Great organisation. Hi I love these activities! I was just wondering where you get your spelling lists from? I love that they have a common theme eg. ir/er sounds. Thank you, this looks great! Just wondering, when do you do the assessment for each group? The day they get their new words? Hello! I have the same question as Jay - when do you assess the students? And how to do decide if they're ready for the next level of words? Thanks!